Let’s play a Sesame Street game. Which of these things is not like the other (we’ll sing it for you, if you’d like)? The answer is #3. Because it doesn’t exist.The other two are real: Conagra makes Peter Pan peanut butter, and startups valued at more than $1 billion are referred to as unicorns. 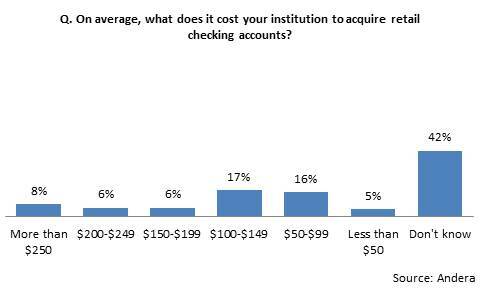 A few years ago, Andera (now a part of Bottomline Technologies) surveyed financial institutions and asked, “On average, what does it cost your FI to acquire retail checking accounts?” About four in 10 respondents couldn’t even give an answer. Those who did were asked how accurate (i.e., within a given margin of error) their estimate was. Six in 10 couldn’t answer that question, and just 12% said they believed their estimate to be within +/- 10%. We fancy ourselves to be open-minded around here, so if you’d like to argue that Peter Pan really doesn’t exist, or that unicorns are just a figment of our imaginations, we’re open to your arguments. If you want to argue about the reality of an accurate DDA cost of acquisition (COA), however, bring it on. They haven’t appropriately allocated marketing investments to individual products. Wait, who are we kidding? You’re probably not even allocating your marketing investments to products at all, let alone appropriately. To do this right, you need an activity-based accounting approach to allocate the marketing dollars that aren’t specific. And it’s a damn good bet that at least some portion of your marketing spend isn’t product-specific. They haven’t accounted for acquisition-related spend that occurs outside of the marketing department. Namely, in the branches, call center and IT. The Andera study found that just half of FIs included branch costs in their COA calculation, and just a quarter included IT costs. They haven’t accurately accounted for costs related to marketing to existing customers. If you’re a loser of a bank and none of your sales comes from existing customers, you can ignore this point. But let’s say you’re a credit union, and, after a year, a member who joined by getting a car loan opens a checking account. Is there no cost to be applied to the opening of that account? Really? Channel acquisition costs are insufficient. One banker told us that his bank couldn’t come up with an accurate overall cost of DDA acquisition, but was pretty confident of the calculation of its online COA, because of its ability to track online marketing costs at the product level (see point #1). But this ignores the fact that online sales can be influenced by offline efforts, and vice versa. (FYI, Bank of America estimates that 60% of its offline sales are influenced by its online marketing efforts.) And as long as online channel sales represent a minority of sales, having a single channel estimate without a reasonably accurate estimate for other channels leaves FIs with insufficient information to make marketing decisions. A single COA number is deceiving. When we heard about the FI with the COA less than $10, we thought: “Great, but what are they getting for that, ~$10? A bunch of Gen Yers with $25 who open free checking accounts, half of whom leave within six months?” In and of itself, a COA number is useless without knowing what you’re getting (i.e., type of customers, deposit amount, cross-sell success) for that cost. 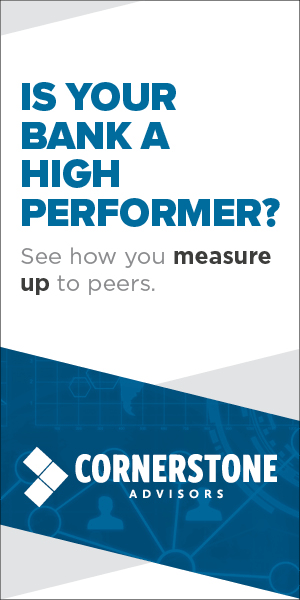 Some bankers respond to this by saying, “Getting an accurate cost of acquisition isn’t our biggest challenge – we’re more focused on calculating the overall marketing return on investment.” But that ignores the fact that, in order to calculate an ROI, you need to accurately measure the investment – which is the COA. An increase in overall COA over time is being caused by a changing mix of customers, and not because of inefficient spending or poor marketing performance. The current COA for a particular consumer segment is simply too high for the level of profitability that segment produces. An increasing percentage of COA is coming from outside marketing, requiring you to explore ways to improve branch, call center and/or online sales productivity. At your current cost of acquiring $1,000 deposits, there’s no way your existing marketing budget will produce the deposit growth goal you’ve set for 2016. Many chief marketing officers at mid-size banks and credit unions that we’ve spoken with recently don’t seem too keen on improving the accuracy of their DDA COA estimates (if they even have one at all). Too much work to calculate it? Too expensive to calculate? No doubt that Marketing will need the help of Finance and other departments to create a more reliable estimate of DDA COA. But that’s all the more reason why CMOs should advocate for it. It’s a metric that captures the cross-channel nature of account acquisition and a way for the CMO to better collaborate with the CFO and heads of other departments. It’s that time of year when Cornerstone Advisors conducts its annual survey of bank and credit union executives to identify key issues and technology priorities for the coming year. The ensuing report will help in your planning efforts and provide great fodder for discussion in your executive team and board meetings. The survey only takes 5 to 7 minutes to complete, and in addition to receiving the report, participants will receive complimentary registration to our 2016 Insights webinar in January where we will present the highlights of the survey results. Agreed that it’s hard to calculate these numbers… without software. But I’m a bit biased. That being said, I think it can be argued that getting to the COA by product AND communication channel is where the real knowledge comes into play. Is the cheapest source of new XYZ loans/deposits coming from existing account holders, Google Organic Web Traffic, Google Paid Web Traffic, Facebook, direct mail, etc.? Knowing the winner and loser communication channels by product allows today’s marketer to make data informed budget reallocations on the fly. Which is nice because bosses love it when you know what you’re doing.